Candy turkeys have been becoming very popular! Look at these cute turkeys made from Nilla Wafers! Use a pastry bag (or a ziplock bag with a corner clipped off) to squeeze a ring of icing on both cookies. Place Choc Cov Cherries in center of first cookie, use 4-6 candy corn pieces to cover a third of the outside edge of the other cookie. Attach "tail" to the CC Cherry. Use very very small amounts of icing to secure eyes and beaks. Beaks are made by breaking off the white tips of candy corn pieces. Optional: Use red tic-tacks or other small red candy under the head to look like the waddle. I usually do this but forgot to pick up the tic-tacks while I was at the store. As each "turkey" is assembled place it in the freezer on a cookie sheet covered w/ wax paper to allow the icing to firm up and set. You can store them in the 'fridge or freezer for a few days provided you wrap each one in plastic. 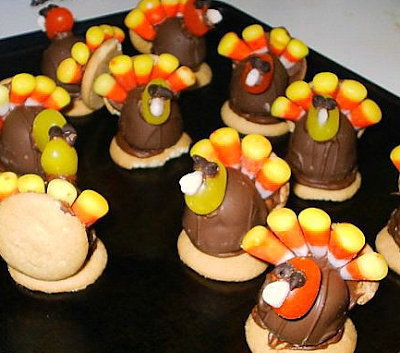 Also, check out our Oreo Turkey recipe!